Kilawing goto and atay is actually ox tripe and beef liver cooked in vinegar, spices and vegetables. Since most kilawin is cured using only vinegar without cooking it on fire, this recipe should be cooked because you cannot eat ox tripe if not tenderized by boiling. 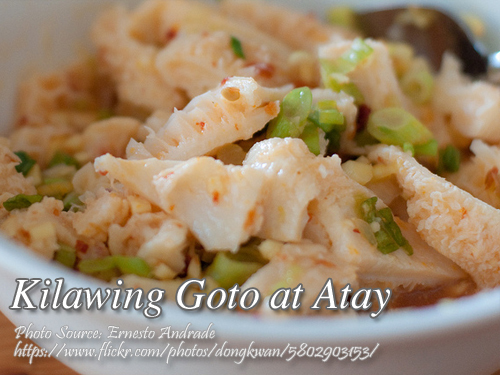 To make kilawing goto at atay; In a kettle, cover tripe with water. Boil for 10 minutes, drain and rinse very well. Cover tripe with water again and simmer until tender. Drain and cut into strips. Soak liver strips in a mixture of vinegar, salt and pepper for 15 minutes; drain and reserve marinade. Saute garlic, onions and tomatoes. Add liver and saute for about 5 minutes, then press liver strips against the pan with the back of spoon to extract some of the juice. Add the marinade, tripe, sugar, and seasoning. Bring to a boil and simmer for a few minutes. Add radish and continue cooking until radish is tender. To see the complete recipe with list of ingredients, continue reading. In a kettle, cover tripe with water. Boil for 10 minutes, drain and rinse very well. Cover tripe with water again and simmer until tender. Drain and cut into strips. Soak liver strips in a mixture of vinegar, salt and pepper for 15 minutes; drain and reserve marinade. Saute garlic, onions and tomatoes. Add liver and saute for about 5 minutes, then press liver strips against the pan with the back of spoon to extract some of the juice. Add the marinade, tripe, sugar, and seasoning. Bring to a boil and simmer for a few minutes. Add radish and continue cooking until radish is tender. Serve hot. Good for 8 persons. Your recipes are so nice!!!!!!!!!! I hope you feature more new products!!!!!!!!!! More Power TO YOu!!!!!!!!!!! I wish to be part of your Filipino Food Recipe’s group. Thanks for your comments. I’m glad you enjoyed this recipe.